Mumbai Indians smashed 148 runs with one wicket in hand at the end of the scheduled 20 overs and Chennai Super Kings were restricted to 125 for the loss of 9 wickets. Kieron Pollard ‘Mumbai Indians’ was declared ‘Player of the match’ for his commendable all round performance in the encounter. 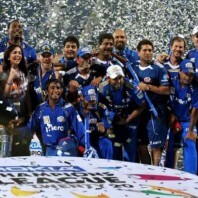 The final of the Indian Premier League 2013, was played on Sunday, May 26, 2013, at the sold out, Eden Gardens, Kolkata. The skipper of the Mumbai Indians, Rohit Sharma, won the toss and preferred to give a tough target to the rival team while batting first. The decision hit back when they lost three top order batsmen for 16 mere runs in 3.2 overs. Dwayne Smith, Aditya Tare and Rohit Sharma lost their wickets for 4, 0 and 2 runs respectively. Dinesh Karthik and Ambati Rayudu got together in a difficult situation as the latter hit 2 fours in the sixth over and Karthik kept on creeping at the other end. The recovery period came to an end at 52 in 9.3 overs as Dinesh Karthik was clean bowled by Chris Morris for 21 off 26 balls with 3 fours. Kieron Pollard walked in next, he hit a four on the first ball he faced and got the first six of the innings in the 13th over. Pollard hit 2 boundaries in the 15th over and the score was enhanced to 100 in 15.1 overs when the stumps of Ambati Rayudu were broken by Dwayne Bravo for 37 off 36 with 4 fours. Pollard took over from thereon as the wickets kept on sliding at the other end. The 20th over was bowled by Bravo and that was an eventful one for both teams since he got two wickets on the first three balls and Pollard ended up with two huge sixes on the last deliveries. Kieron Pollard remained unbeaten for 60 off just 32 deliveries with 3 mighty sixes and 8 fours as Mumbai Indians piled up 148 for the loss of 9 wickets. Dwayne Bravo was the star performer with four wickets, Albie Morkel held two whereas Mohit Sharma and Chris Morris claimed one wicket each. Lasith Malinga delivered a remarkable first over when he uprooted the stumps of Michael Hussey for one and removed Suresh Raina for a duck on the very next ball. S Badrinath was caught behind by Karthik off Mitchell Johnson without scoring in the second over and Chennai Super Kings were reeling at 3-3 in 1.4 overs. Dwayne Bravo and Murali Vijay survived a few anxious moments as the latter hit 2 fours in the 4th over. Bravo got three boundaries and was dropped at 14 by Karthik off Rishsi Dhawan but was gone on the next delivery for 15. Ravindra Jadeja was caught by Pollard at long-off in the first over from Harbhajan Singh without any run and Murali Vijay became the second victim of Johnson for a duck as well. Chennai Super Kings were in all sorts of problems at 6-39 in 7.3 overs and the destination looked far away from them. It was left to MS Dhoni who kept the charge on by hitting regular boundaries as the wickets were sliding regularly at the other side. He stood firm by dispatching 63 off 45 with 5 towering sixes and 3 fours as Chennai Super Kings scored 9-125 after 20 overs. Lasith Malinga, Mitchell Johnson and Harbhajan Singh were the master bowlers with two wickets each whereas Pragyan Ojha, Rishi Dhawan and Kieron Pollard shared one wicket each. 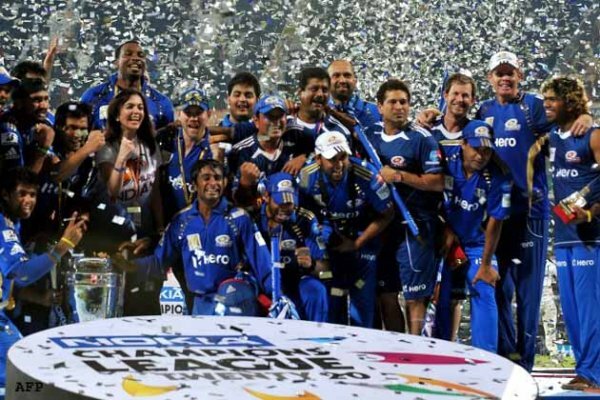 Mumbai Indians won the Indian Premier League 2013 by a good margin of 23 runs and that was their first title in the six tournaments held so far. Tags: Ambati Rayudu, Chennai Super Kings, Dwayne Bravo, Final, IPL 2013, Kieron Pollard, Mitchell Johnson, MS Dhoni, Mumbai Indians, Murali Vijay.